The focus of Snug Harbour Resort's charm and beauty are in it's rustic cottages set amongst the splendor of tall majestic pines. All twelve fully-equipped house-keeping cottages have their own spectacular view of Desert Lake. In addition, visitors can barbecue and relax in the comfort of their own generous, private yard with picnic table and chairs. Cottages one to six are two-bedroom cottages while cottages seven to twelve have three-bedrooms. Each cottage has a bathroom (with shower), dining/living area and kitchen (with utensils, microwave, toaster, coffee maker, stove and fridge). The majority of the cottages have wood stoves for heat except #7, 8, 9 and 10 which have electric heat. Although most everything is provided with the cottages, we do ask that you bring your own bedding (sheets, blankets, pillows, pillow cases) and towels and dish-towels. Please click on a cottage in the resort layout below for a tour of a particular cottage. Each link includes pictures showing the outside, inside and views of the cottage. Visitors to Snug Harbour Resort will find the scenery most appealing. 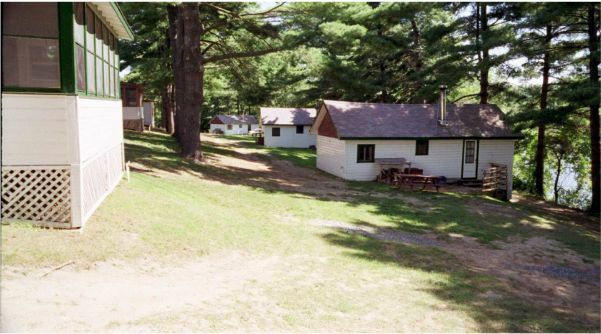 The lake-side cottages are set amongst mature pine trees and expansive lush lawns. Although the cottages have ample room for relaxing or playing, the resort has additional green-space that includes a children's play area and basketball net. Desert Lake is easily accessible from all cottages. You will especially enjoy your own private beach with a gentle drop-off and swim-platform. Fishermen and boaters should note that we have a boat-launch, two docking facilities and boat-house. Snug Harbour Resort has a small store which offers a variety of food staples, snacks, and ice cream treats. For the fishermen, we sell fishing gear, live bait and have a full rental fleet that includes Lund boats and 9.9 HP motors. We also have canoes and kayaks for rent.